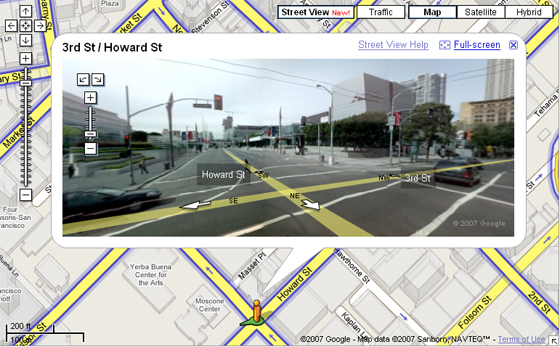 Google has will be announcing a new 360 streetside view for Google maps at Where 2.0 today, says O’Reily Radar. The 360 views are a better version of Amazon’s A9 static panoramas. Google’s views let users virtually stand in the middle of any street, able to look in a full circle around the location, giving a better feel of the place you’ll be going. It will reportedly be available in Denver, Las Vegas, Miami, New York and San Francisco. The imaging used in the new feature was collected by a company called Immersive Media, whose vans throughout these cities to collect the photos. You can see a demo here.